Longwood Gardens has announced that its Main Fountain Garden will make its grand return on May 27, 2017, following a two-year, $90 million revitalization. The crown jewel of the most significant fountain collection in North America, Longwood’s Main Fountain Garden rivals the magnificent fountains of Europe with its beauty and ingenious application of leading-edge technologies and design. The Garden will premiere with a Summer of Spectacle delighting visitors with incredible fountain shows, fireworks, tours and programs to jump start a season of celebration. The premiere Summer of Spectacle season, May 27– September 30, will include an array of special programming. In addition to daily fountains shows, guests will enjoy tours, concerts, and special events throughout the summer. 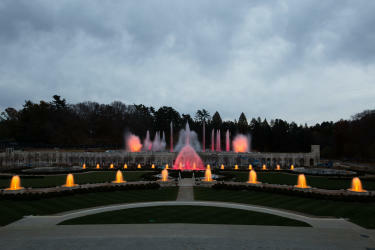 The gardens will have extended visiting hours on Thursdays, Fridays, and Saturdays for evening illuminated Fountain Shows. In addition, the popular Fireworks & Fountains shows, featuring illuminated fountains and fireworks choreographed to music, will return with six exciting special shows on May 28, July 2, July 22, August 12, September 2, and September 16. General admission tickets and Fireworks & Fountains show tickets go on sale in the spring. 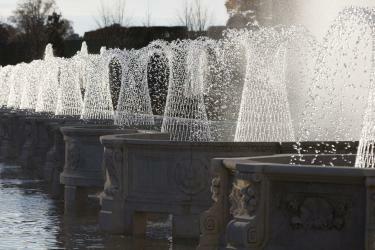 The Main Fountain Garden is a hallmark of the Longwood experience visited by more than 1.35 million people each year. In 1931, Longwood’s founder Pierre S. du Pont debuted the Main Fountain Garden, which was inspired by 20th century technology from the world&apos;s fairs and the beauty of renowned European gardens. As Longwood embarked on preserving the Garden, the team looked to the future to honor his vision and ensure the continued enjoyment of the fountains with an original concept of “adaptive restoration” guiding thousands of design, restoration, and technology application decisions. Highlights of the project include a complete restoration of 4,000 pieces of limestone, new mechanical and electrical infrastructure, and a brand new Garden experience, the Grotto. To improve guest access, enhanced pathways, an elaborate boxwood hedge, and inviting alleés are being created. The use of cutting-edge technology will bring the fountain displays soaring to greater heights, making the revitalized Main Fountain Garden a truly unmatched visitor experience. Beyer Blinder Belle, the premier architectural firm specializing in historic preservation, is leading the renovation project and a team of local, national, and international designers. BBB is also leading efforts related to reimagining the existing architecture to accommodate a greater range of guests and to improve access to different areas of the Garden. West 8, a world renowned landscape architecture firm, is designing the garden’s public spaces to amplify the original design and enhance the Main Fountain Garden’s horticultural elements, as well as creating gardens that will be new amenities for Longwood’s guests. Fluidity Design Consultants, a Los Angeles-based water feature design and engineering firm, oversees the incorporation of state-of-the-art infrastructure to the fountains. 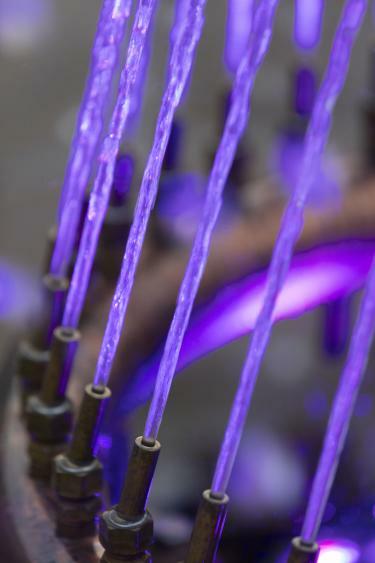 They are also adding exciting new capabilities to control the water’s movement that will enhance Longwood’s renowned Illuminated Fountain Shows set to music. Experience the grand return of the Longwood Gardens Main Fountains with the 2017 Brandywine Treasure Trail Passport - your single-ticket access to 11 of the Brandywine Valleys top attractions. The Passport is valid Memorial Day through Labor Day and available for individuals, as well as families. Learn more at VisitWilmingtonDE.com/Passport. In 1906, industrialist Pierre du Pont (1870-1954) purchased a small farm near Kennett Square, Pa., to save a collection of historic trees from being sold for lumber. Today, Longwood Gardens is one of the world’s great horticultural displays, encompassing 1,077 acres of dazzling gardens, woodlands, meadows, fountains, 10,010-pipe Aeolian organ and 4.5-acre conservatory. Longwood continues the mission set forth by Mr. du Pont to inspire people through excellence in garden design, horticulture, education and the performing arts, through programming that includes exhibitions, musical performances by leading artists, renowned horticulture education programs, horticulture research, environmental stewardship, and community engagement. About Scott: As a lifelong Delawarean I love my State and am very proud to call it home. While I love to travel, I try not to forget how many amazing things there are to see and do right here in my own back yard. Stay tuned to my blog postings and you'll learn everything from my passion for a good movie to how much I enjoy local theatre, Wilmington festivals, art and so much more.